I, like many, am constantly searching for the perfect blend of to-do list meets productivity system, meets time management. I'm happy to report that I've finally concocted a system that works. 1. Start with some SelfControl. 2. Then pull from your Kanban. 3. Don't forget to add Pomodoro! I've given up on the idea that my paultry lizard-brain can resist the temptations of the internet whilst trying to get meaningful work done. So now I do the equivalent of chaining myself to the desk: I use a little program called SelfControl that automatically blocks access to certain websites, for a certain amount of time. An elegant black countdown clock shows me how much time I have left before the internet becomes a free-for-all again. No amount of quitting, logging out, or rebooting will reverse your decision to block those pesky websites. 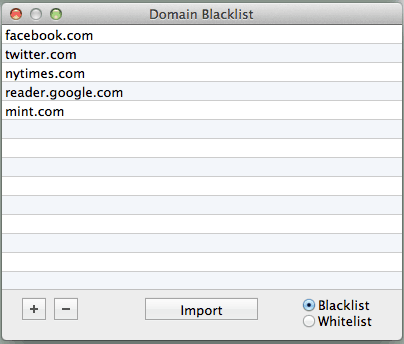 Which sites you choose to block are up to you- you simply add the high level domains on your blacklist. What's on your black list? Don't even try to tell me that you don't have any sites that are not time-wasters for you. What are they? Do you dare to load them into SelfControl? Windows Users: SelfControl is Mac only, but you should check out SelfRestraint, which was developed as a Windows alternative to SelfControl.